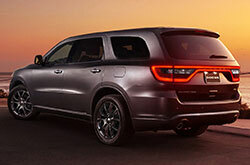 A handsome SUV with a lot of power under the hood, the Dodge Durango is ready to roll through Scottsdale. With a spacious cabin, versatile seating and top-of-class towing power, the Dodge SUV is a perfect vehicle for families who need a lot of cargo space to move around. The mid-size SUV doesn't sacrifice in style or comfort, and can be had with an assortment of appearance packages and available luxuries. 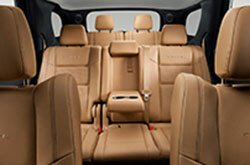 This model year brings new seating arrangement options, as well as updated trim levels buyers are sure to love. Continue reading our review below to learn more about the 2017 Dodge Durango near Phoenix. The 2017 Durango can now be outfitted with two or three rows, offering seating for five to seven passengers. 2017 Dodge Durango reviews appreciate that the SUV is well-equipped starting from the base SXT trim. 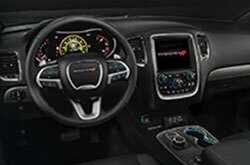 Keyless ignition, heated mirrors, an auto-dimming rearview mirror and a 5-inch touchscreen are just a few of the standard features. New this model year is the GT trim which replaces the outgoing Limited. GT boasts LED running lights, dual exhaust tips, a heated steering wheel and heated seats along with an upgraded 8.4-inch touchscreen with voice control. The top-tier Citadel and R/T trims add all the bells and whistles with xenon headlights, automatic wipers, chrome trim and a power liftgate on the exterior, and leather upholstery, ventilated seats, a navigation package and more on the interior. Standard, the 2017 Dodge Durango is equipped with a 3.6-liter V6 that pushes out 290 horsepower and 260 lb.-ft. of torque. The sporty R/T trim shows off a 5.7-liter V8 that delivers 360 horsepower and 390 lb.-ft. of torque, and adds a sport-tuned suspension. Both powertrains are mated to an eight-speed automatic, and are available in rear-wheel or all-wheel drive configurations. The 2017 Durango flexes some serious muscle with impressive towing capacity on both powertrains. When properly equipped, the V6 is rated at 6,200 lbs. and the V8 at 7,400 lbs. 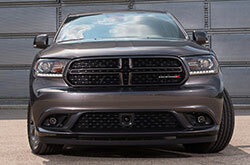 2017 Dodge Durango reviews are also impressed with the load-leveling rear suspension that improves ride quality when the SUV is carrying heavy loads. 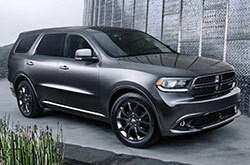 All models of the 2017 Dodge Durango in Scottsdale are fitted with a high-quality airbag system, antilock brakes, and stability and traction control. Starting on the GT trim, the Durango has a rearview camera and rear parking sensors, which offer a great visibility boost especially when towing a trailer. Higher grades are available with safety packages, which add select drive assist features like blind spot monitoring, forward collision warning with automatic braking and lane departure warning.